Brave the frozen fairways or settle in for a couple of hours on the driving range and iron out some of the glitches in your swing? To some of us, neither activity is particularly appetising at this time of the year as clubs gather dust in a cupboard until the green shoots of spring return and people start talking about the US Masters. 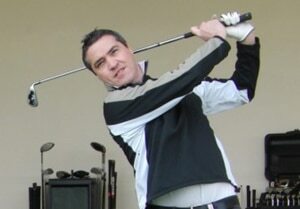 In fact, some prefer to do their golfing on the computer or games console until it warms up a bit. But down at Tournerbury Golf Centre on Hayling Island, you can combine them both, while making some serious improvements to your game. Plane Truth coach Kevin Flynn put my swing through its paces in the swing studio with a bit of help from FlightScope – a golf launch monitor to analyse the swing of an erratic 14 handicapper.